I wanted to write something about September 11, 2001 today. I still remember the shock and the disbelief with which I watched it and the immediate knowledge that we were under attack. It doesn’t seem possible that it has been nine years. Anyway, I wanted to write something about it. Something about the heroic people who saved lives. Something heartfelt and inspiring about the survivors, something comforting for all the families who lost loved ones, something patriotic about how we all came together as a nation. But I just can’t find the words. They refuse to come…only the images come to mind. So, instead I will share a couple of songs. One song that describes the feelings of that morning…all of the emotions that tumbled one over the other and then back around again… confusion, disbelief, horror, fear, anger and heartbreak, leaving me finally with only heartbreak and anger. Yes, my heart is still broken for all those families ripped apart, lives irretrievably shattered, for orphans and widows made that day and yes, my anger is still there too. I cannot completely let go of the anger as long as I keep that image in my mind and that image has not faded in all of these years. That is why I cannot write any other words about this day in history…I will say things that I probably should just left unsaid. The other song is patriotic and hopeful and those are the things with which I replace my anger…over and over again because it only seems to work for a short while. So I will leave it at that. I hope those who experienced 9/11 will never forget it and will make sure their children know of it and remember it and that we as a nation will quit apologizing for something that we did not cause and will stand strong and will never allow this to happen again. Okay, enough said…just listen! If you want to see something really cool…visit Christie Cottage today! 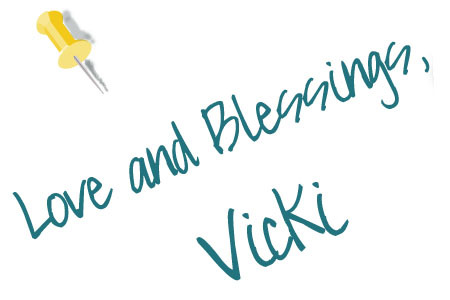 Thank you Vicki for this beautiful tribute and remembrance. The music and images from that day still bring tears to my eyes. As a nation we stood tall on that day and the days following, but somehow during the last nine years we have lost something of the American strength and determination. I pray that we will always remember and once again stand strong. And that we never have to go through anything like this again. Dear Vicki, I share your heartache and your anger over this tragedy.